The anthropologist C. Scott Littleton defined comparative mythology as "the systematic comparison of myths and mythic themes drawn from a wide variety of cultures". By comparing different cultures' mythologies, scholars try to identify underlying similarities and/or to reconstruct a "protomythology" from which those mythologies developed. To an extent, all theories about mythology follow a comparative approach: as the scholar of religion Robert Segal notes, "by definition, all theorists [of myth] seek similarities among myths". However, scholars of mythology can be roughly divided into particularists, who emphasize the differences between myths, and comparativists, who emphasize the similarities. Particularists tend to "maintain that the similarities deciphered by comparativists are vague and superficial", while comparativists tend to "contend that the differences etched by particularists are trivial and incidental". Comparative mythologists come from various fields, including folklore, anthropology, history, linguistics, and religious studies, and they have used a variety of methods to compare myths. These are some important approaches to comparative mythology. Some scholars look at the linguistic relationships between the myths of different cultures. For example, the similarities between the names of gods in different cultures. One particularly successful example of this approach is the study of Indo-European mythology. Scholars have found striking similarities between the mythological and religious terms used in different cultures of Europe and India. For example, the Greek sky-god Zeus Pater, the Roman sky-god Jupiter, and the Indian (Vedic) sky-god Dyauṣ Pitṛ have linguistically identical names. This suggests that the Greeks, Romans, and Indians originated from a common ancestral culture, and that the names Zeus, Jupiter, Dyaus and the Germanic Tiu (cf. English Tues-day) evolved from an older name, *Dyēus ph2ter, which referred to the sky-god or, to give a perfect English cognate, the day-father in a Proto-Indo-European religion. Some scholars look for underlying structures shared by different myths. The folklorist Vladimir Propp proposed that many Russian fairy tales have a common plot structure, in which certain events happen in a predictable order. In contrast, the anthropologist Claude Lévi-Strauss examined the structure of a myth in terms of the abstract relationships between its elements, rather than their order in the plot. In particular, Lévi-Strauss believed that the elements of a myth could be organized into binary oppositions (raw vs. cooked, nature vs. culture, etc.). He thought that the myth's purpose was to "mediate" these oppositions, thereby resolving basic tensions or contradictions found in human life or culture. Some scholars propose that myths from different cultures reveal the same, or similar, psychological forces at work in those cultures. Some Freudian thinkers have identified stories similar to the Greek story of Oedipus in many different cultures. They argue that these stories reflect the different expressions of the Oedipus complex in those cultures. Likewise, Jungians have identified images, themes, and patterns that appear in the myths of many different cultures. They believe that these similarities result from archetypes present in the unconscious levels of every person's mind. A new approach, which is both historical and comparative, has recently been proposed by E.J. Michael Witzel. He compares collections of mythologies of various cultures, from Iceland and Egypt to the Mayas, and reconstructs increasingly older levels, parallel to but not necessarily dependent on language families (see above). The most prominent common feature is a story line that extends from the creation of the world and of humans to their end. This feature is found in the northern mythologies of Eurasia and the Americas ("Laurasia") while it is missing in the southern mythologies of Subsaharan Africa, New Guinea and Australia ("Gondwanaland"). The latter is the older one, going back to the dispersal of Homo sapiens out of Africa, some 65,000 years ago. Based on these two reconstructions he offers some suggestions about the tales of the (genetic) "African Eve". Close attention is paid to the largely parallel developments in archaeology, paleontology, genetics and linguistics. He also makes some suggestions about the persistence of these Stone Age myths in current religions. 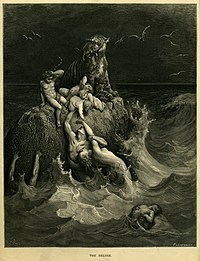 The Deluge, frontispiece to Gustave Doré's illustrated edition of the Bible. Based on the story of Noah's Ark, this engraving shows humans and a tiger doomed by the flood futilely attempting to save their children and cubs. Comparative mythology has uncovered a number of parallels between the myths of different cultures, including some very widespread recurring themes and plot elements. Here are some examples. Cultures around the world tell stories about a great flood. In many cases, the flood leaves only one survivor or group of survivors. For example, both the Babylonian Epic of Gilgamesh and the Hebrew Bible tell of a global flood that wiped out humanity and of a man who saved the Earth's species by taking them aboard a boat. Similar stories of a single flood survivor appear in Hindu mythology as well as Greek, Norse mythology and Aztec mythology. Many cultures have stories about divine figures whose death creates an essential part of reality. These myths seem especially common among cultures that grow crops, particularly tubers. One such myth from the Wemale people of Seram Island, Indonesia, tells of a miraculously-conceived girl named Hainuwele, whose murdered corpse sprouts into the people's staple food crops. The Chinese myth of Pangu, the Indian Vedic myth of Purusha, and the Norse myth of Ymir all tell of a cosmic giant who is killed to create the world. Many myths feature a god who dies and often returns to life. 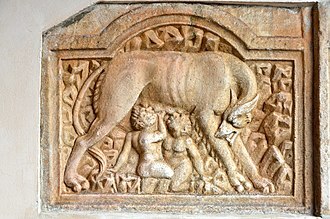 Such myths are particularly common in Near Eastern mythologies. The anthropologist Sir James Frazer compared these "dying god" myths in his multi-volume work The Golden Bough. The Egyptian god Osiris and the Mesopotamian god Tammuz are examples of the "dying god", while the Greek myths of Adonis (though a mortal) has often been compared to Osiris and the myth of Dionysos also features death and rebirth. Some scholars have noted similarities between polytheistic stories of "dying gods" and the Christian story of Jesus of Nazareth. A number of scholars have suggested that hero stories from various cultures have the same underlying structure. Other scholars, including FitzRoy Somerset, 4th Baron Raglan and, more recently, Joseph Campbell, have also suggested that hero stories share a common structure. Some comparative mythologists look for similarities only among hero stories within a specific geographical or ethnic range. For example, the Austrian scholar Johann Georg van Hahn tried to identify a common structure underlying "Aryan" hero stories. Others, such as Campbell, propose theories about hero stories in general. According to Campbell's "monomyth" hypothesis, hero stories from around the world share a common plot structure. Because of its extremely comparative nature, the monomyth hypothesis is currently out of favor with some religious scholars such as Lesley Northup. Associated with many mythological hero stories, giants (from Latin and Ancient Greek: gigas, cognate giga-) are beings of human appearance, but of prodigious size and strength common in the mythology and legends of many different cultures. In various Indo-European mythologies, gigantic peoples are featured as primeval creatures associated with chaos and the wild nature, and they are frequently in conflict with the gods, be they Olympian, Celtic, Hindu or Norse. Giants also often play similar roles in the mythologies and folklore of other, non Indo-European peoples, such as in the Nartian traditions or the asuras in Hindu mythology. Many mythologies mention a place that sits at the center of the world and acts as a point of contact between different levels of the universe. This "axis mundi" is often marked by a sacred tree or other mythical object. For example, many myths describe a great tree or pillar joining heaven, earth, and the underworld. Vedic India, ancient China, Mayans, Incas and the Germanic peoples all had myths featuring a "Cosmic Tree" whose branches reach heaven and whose roots reach hell. Many cultures have a creation myth in which a group of younger, more civilized gods conquers and/or struggles against a group of older gods who represent the forces of chaos. In Hindu mythology, the younger devas (gods) battle the older asuras (demons), though both are born from the same father, Kashyap, the grandson of Brahma. In the Greek myth of the Titanomachy, the Olympian gods defeat the Titans, an older and more primitive divine race, and establish cosmic order. Similarly, the Celtic gods of life and light struggle against the Fomorians, ancient gods of death and darkness. This myth of the gods conquering demons - and order conquering chaos - is especially common in Indo-European mythologies. Some scholars suggest that the myth reflects the ancient Indo-Europeans' conquest of native peoples during their expansion over Europe and India. Many cultures believe in a celestial supreme being who has cut off contact with humanity. Historian Mircea Eliade calls this supreme being a deus otiosus (an "idle god"), although this term is also used more broadly, to refer to any god who doesn't interact regularly with humans. In many myths, the Supreme Being withdraws into the heavens after the creation of the world. Baluba mythology features such a story, in which the supreme god withdraws from the earth, leaving man to search for him. Similarly, the mythology of the Hereros tells of a sky god who has abandoned mankind to lesser divinities. In the mythologies of highly complex cultures, the supreme being tends to disappear completely, replaced by a strongly polytheistic belief system. Many cultures have myths describing the origin of their customs, rituals, and identity. In fact, ancient and traditional societies have often justified their customs by claiming that their gods or mythical heroes established those customs. For example, according to the myths of the Australian Karajarri, the mythical Bagadjimbiri brothers established all of the Karadjeri's customs, including the position in which they stand while urinating. ^ Segal, "The Romantic Appeal of Joseph Campbell"
Dimmitt, Cornelia, and J. van Buitenen, eds. and trans. Classical Hindu Mythology. Philadelphia: Temple University Press, 1978. Cosmos and History: The Myth of the Eternal Return. NY: Harper & Row, 1959. Images and Symbols. Trans. Philip Mairet. Princeton: Princeton University Press, 1991. Myth and Reality. Trans. Willard Trask. NY: Harper & Row, 1963. Shamanism: Archaic Techniques of Ecstasy. Princeton University Press: Princeton, 2004. Frankfort, Henri. "The Dying God". Journal of the Warburg and Courtauld Institutes 21.3-4(1958): 141-51. Graves, Robert. "Jungian Mythology". The Hudson Review 5.2(1952): 245-57. Hesiod. Works and Days and Theogony. Trans. Stanley Lombardo. Indianapolis: Hackett Publishing Company, 1993. "Le motif de Pygmalion : origine afrasienne et diffusion en Afrique". Sahara, 23, 2012c: 49-59 . Johnson, Allen, and Douglass Price-Williams. Oedipus Ubiquitous: The Family Complex in World Literature. Stanford: Stanford University Press, 1996. Lévi-Strauss, Claude. Structural Anthropology. Trans. Claire Jacobson. New York: Basic Books, 1963. McGinn, Bernard. Antichrist: Two Thousand Years of the Human Fascination with Evil. NY: HarperCollins, 1994. Propp, Vladimir. The Morphology of the Folktale.Trans. Laurence Scott. Texas: University of Texas Press, 1968. Robertson, John. Pagan Christs. London: Watts & Co., 1911. Hero Myths: A Reader. Blackwell Publishing, 2000. Theorizing About Myth. Massachusetts: University of Massachusetts Press, 1999. Untitled book review. History of Religions 32.1(1992): 88-90. Squire, Charles. Celtic Myth and Legend. London: Gresham, 1905. Taylor, Archer. "The Biographical Pattern in Traditional Narrative". Journal of the Folklore Institute 1.1-2(1964): 114-29. Tehrani, Jamshid J., "The Phylogeny of Little Red Riding Hood", PlosOne, November 13, 2013. Tortchinov, Evgueni. "Cybele, Attis, and the Mysteries of the 'Suffering Gods': A Transpersonalistic Interpretation". The International Journal of Transpersonal Studies 17.2(1998): 149-59. Urton, Gary. Inca Myths: The Legendary Past. Texas: University of Texas Press, 1999. Woolley, Leonard. "The Flood". The South African Archaeological Bulletin 8.30(1953): 52-54. Arvidsson, Stefan, Aryan Idols. Indo-European Mythology as Science and Ideology. 2006. University of Chicago Press. Lincoln, Bruce Theorizing Myth: Narrative, Ideology, and Scholarship. 1999. University of Chicago Press. Wise, R. Todd, A Neocomparative Examination of the Orpheus Myth As Found in the Native American and European Traditions, 1998. UMI.